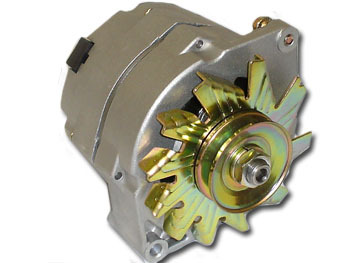 This is the most popular high output replacement alternator. 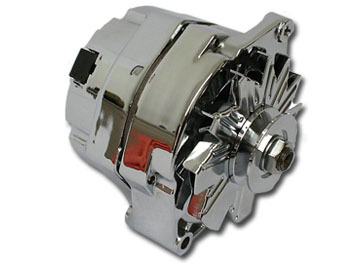 This Quality Power alternator can be used as a high output replacement for stock alternators or generators or as a simple 1 wire hookup on street rods. This is the same as the early GM 10SI and 12SI internally regulated alternator but built to provide higher output at idle. It requires only the battery cable (1-wire) to be hooked up at the rear of the unit. Install the alternator, start the vehicle, step on the gas slightly and the alternator will start to charge on its own. This is the easiest installation possible! We build these units to provide as much amperage at an idle as the original does at max RPM. They can also be used to control a dash light by using our W290 wiring harness. These alternators will replace externally and internally regulated alternators in GM vehicles from 1963 through 1983. Also perfect for street rods and project cars. Need more amperage than this alternator can provide? CLICK HERE to see our Mega Amp alternator that is a direct replacement for this unit. See our brackets section for special ways to use this alternator to replace generators and for flathead Ford installations.